We are talking about units of measure in school, so I made this version of me. I was in the office helping Dad with taxes and he took some photos of me. Aunty Pants came to visit yesterday and we became good buddies. I think I found Cameron's two missing lower teeth -- in my mouth! Spring Break is a great time to go through the old school projects and share them with you. Here is Ben's dinosaur extra credit poster from March. Here is Cameron's bird head band from the Spring celebration. Ben's class studied solids and liquids. He did a good job on his reports. Cameron wrote a book about spring and all of the things we see in spring. Cameron also made this robin. Some oldies but goodies: the snow flake and the lady bug. Since we were down there anyhow, we stopped at Mall of America. Ben and Cameron wanted to go to the LEGO store, and Mommy wanted to get a new purse. We had lunch at a place called Crave, where Ben had his first sushi (it was okay, but two pieces were no where near enough for him). 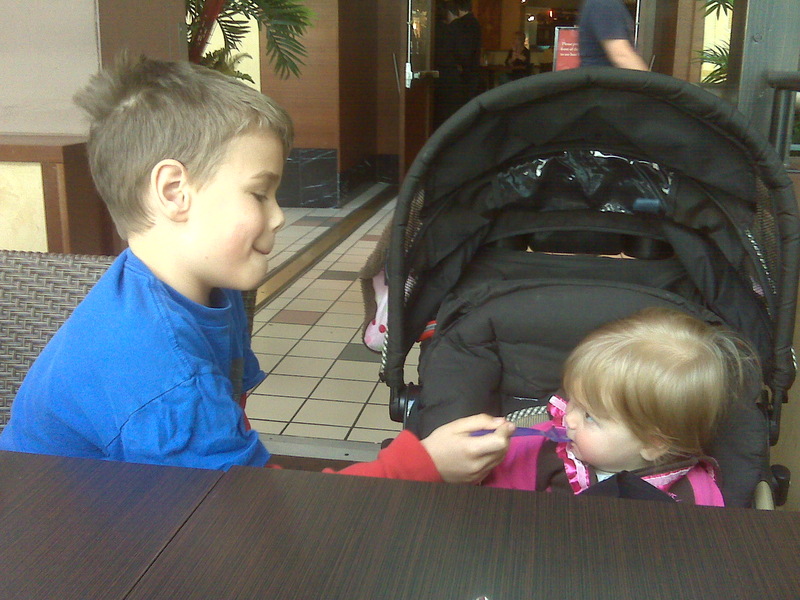 Here's the only picture we took from this stop - Ben feeding Ainsley her "sushi" (ok, applesauce). The Minnesota Zoo is a long, long way from our house, so we had never been (except for Ben on a field trip once). Today, we changed that. It looks like we went up north on a trip so the Maritz Family lodge, but really this was the start of the Minnesota Trail, which highlights animals and habitats from Minnesota. We think Dad was suggesting that Ben is a gray wolf and Cameron is a coyote here. Ainsley eyed the gray wolf sculpture with some skepticism. Ben's wingspan is slightly smaller than a bald eagle. Cameron's is slightly bigger than a swallow. After the Minnesota Trail, we went on the tropical trail. We also got to pet an African millipede. We saw some marine animals inside and then we visited the animal sculpture garden. Next, we headed into the Grizzly Coast, where we suddenly became fascinated with having our pictures taken. We were trying to wrangle Ainsley for a picture with another wolf sculpture, when this young man jumped up behind the world. Dad told him to smile too, and he did. This year, we decided to stay around home during spring break and do things we've talked about doing, but never did. 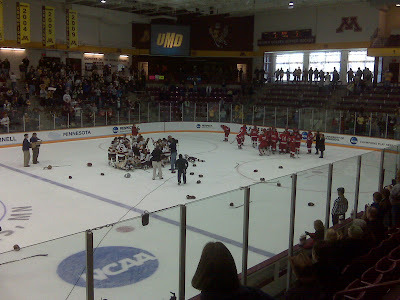 Part 1: Go see a hockey game. We wanted to go see the Wild play the Flames, but tickets were $96 each. 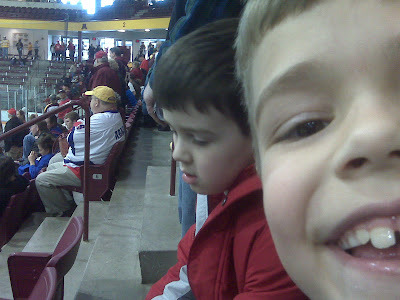 Instead, we went to see the Women's NCAA "Frozen Four" Ice Hockey Championship, where three tickets that were on center ice and four rows behind the bench were $84 (total). Here's our view of center ice during warm ups. Here's how close we were to the UM-Duluth bench. Here we are! We ended up sitting by a lot of current and former women's Olympic hockey super stars. 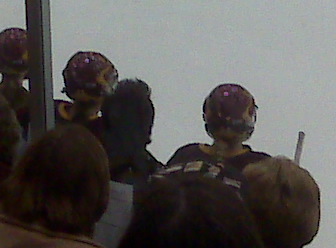 Julie Chu sat right behind us and gave us pointers throughout the game. 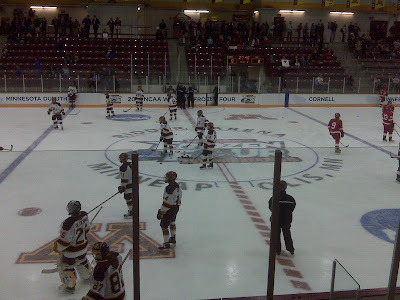 The game was the University of Minnesota - Duluth versus Cornell. In the end, the game went to triple over time. UMD had a power play goal with 30 seconds to go the third over time to win! We celebrated St. Patrick's Day by going outside for a walk! It's finally nice enough for me to go outside, and I love it! ... is my two front teeth! I lost my first teeth, two days in a row! We went to see the Minnesota Orchestra and the Minnesota Dance Theatre perform "Carnival of the Animals" today at Orchestra Hall. Here we are before the show. I really enjoyed myself, and I think I might be a ballerina someday. PS: A special thanks to our friends to Target for footing the bill! I got my first real haircut today. Many of you have said to my parents, "She's too young!" or "Already?!" People, look at what I'm working with. So, yes, we went to Kid's Hair today and I got a haircut. I sat in the chair by myself like a big girl without crying at all. 7 (and a half) months!